A blue cart was placed in front of everyone's home on the 1200 block of South State in the South Loop last week. Trouble was, they belonged in the alley. But apparently the city puts them in front of your house and you have to move them through your gangway and through your yard and into your alley yourself. Or go all the way around the block--and then into the alley if you don't want to disturb your foliage. Or hire a crane to swing it up and over your house, I suppose. Because The City that works doesn't work well enough to put the new blue garbage cans in the alley. Not even in Bridgeport--where last week the blocks between 31st and Archer, Racine and Pitney were peppered (or should I say littered) with a blue cart in front of every house. Next problem: what exactly IS and ISN'T recyclable, the blue carts being the cans for the stuff that can be recycled. Each new blue cart comes with a brochure that explains what is and isn't. Believe me, it's hard figuring out if a container is plastic--especially the kind of plastic they refer to in the brochure--or flimsy metal, for instance. And is it ok to put flimsy metal in the recyclables? A regular metal can like a tuna fish or soup can is ok. But what if it's a container under pressure with unused frosting that you didn't like in it? Is that recyclable? And cardboard. Is it ok to put your cereal box in? And what about styrofoam? The stuff that says right on it that it's recyclable--like from a leftover at a restaurant. Maybe it's ok, but how come the official city brochure doesn't mention styrofoam? And does adhering coffee powder on what might be paper or tin foil spoil the recycling process? Not to mention the leftover leftovers in the styrofoam containers. If it turns out that styrofoam doggie-bags really are recyclable, according to city standards. And just for good measure--what about saran wrap? What is it exactly? Plastic? Or some kind of paper? Of course, if you cared about the environment you wouldn't use saran wrap in any case, you big lug, you. This informative confession on his part got the wheels turning amongst the neighbors for whom recycling is all new. Should we dump some of the regular old black cans that are already in our alley? Turn them back to the city or something. (Maybe we can recycle them?) 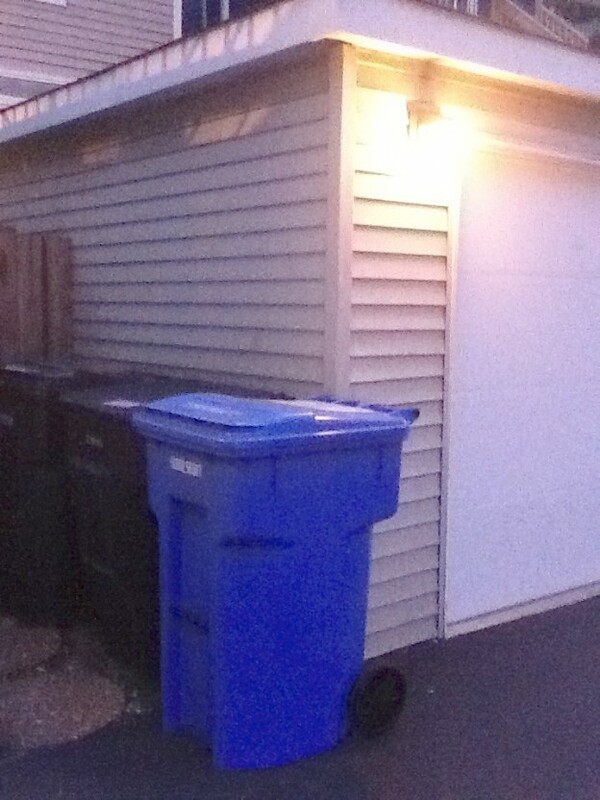 All told, the delivery of 35 new blue trash containers has suddenly put space at a premium in our alley. I mean, with twice the number of cans, how will the collectors even have room to collect it? Which brings me to another space issue. One in my own home. The need to have TWO trash cans. Because once you figure out what the trash is (recyclable/non-recyclable), you have to put it in one trash container or the other right in your house. I had a good idea for that. Our collection of Trader Joe's double shopping bags--which probably numbers well into the thousands by now: separate the two bags and use them for the recyclables, getting double bang for the buck by dumping each filled bag itself into the blue can and thereby lessening the hoarding-look in the house, much of which is caused by piles of Trader Joe's shopping bags. Ok. But. I'm now coming to the last downside of the recycling process. And it goes like this. The real trash has a lid--because it's well, it's real trash. And could decay and smell and otherwise deteriorate into a mess in the kitchen that needs to be covered before being removed to the trash can in the alley. Ok, ok, one more problem to consider: are diamonds recyclable?